Through years of struggling with mice, keyboard shortcuts, and the like, stacks of hand-written notation alongside the computer, this was what I imagined – and probably you, too, if you work with handwritten scores. 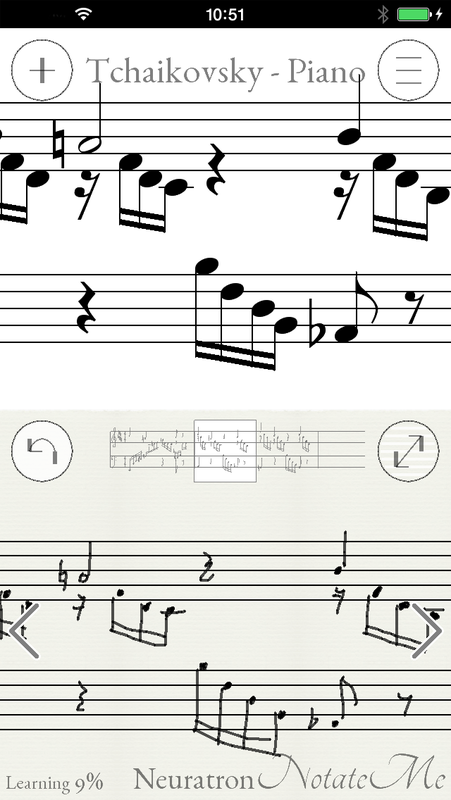 NotateMe promises to take hand-written notation from your fingertip or stylus and recognize music, from simple lead sheets to full orchestral scores. For those working with scores, it’s what you dreamt devices like the iPhone would do from the beginning. NotateMe is now in public beta, and we hope to talk to the creators, but wanted to get your feedback first about what you’d like to know. A lot of recognition features are already there, and you can export to MIDI or MusicXML to finish your score in software like Sibelius or Finale, readying it to share with others. NotateMe will also play back your score ideas. That means this could be a tool for anyone who does use music notation to scrawl quick ideas on the go – even if the ultimate end goal isn’t necessarily scores for other people. Audio entry – singing or playing into your phone or tablet. Scanning from your phone or tablet’s camera. If NotateMe doesn’t recognize your style immediately, keep at it, as it will adjust. Another piece of advice is to make markings clearer with further strokes if any transcription errors occur. If you still experience problems, tap ‘Help Improve NotateMe’ from the Export menu and we will analyze your handwriting to see how we can make it work for you. For US$13.99 on iTunes and Google Play (half-price during the beta), it seems worth a try. Even with racks of synths and the like, sometimes notation is for many of us the best means of capturing an idea. And it’s great to see a small, independent developer taking this on. Ironically, I think the in-app purchase model is perfectly suited to notation. I once observed to the creators of Sibelius that there wasn’t really a “beginner” or “advanced” model of notation – only what individuals needed to do in their own music. Shapenote notation to an average musician, for example, is “advanced” – but to the person doing that every day, it’s basic. Let us know if you try this out, and if you have questions for the app’s producers.